1) I saw this video on YouTube and decided to find out if this is really possible. 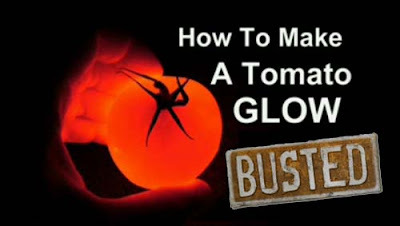 I tried it, but my tomato looked nothing like this picture - not even the faintest glow. All I ended up with was a leaky, stinky mess. This myth is busted. And while we're on the subject of needles, here is my impressive collection of used ones. The grand total is 491! I must give Q credit for helping me out with maybe ten of the PIO shots, but I self-injected with the other 481. I turned all my sharps in at the clinic today. No more needlework for me! Time to find a new hobby! Fun Math Fact: If you put just the needles end to end they would reach over 26 feet (8 meters). 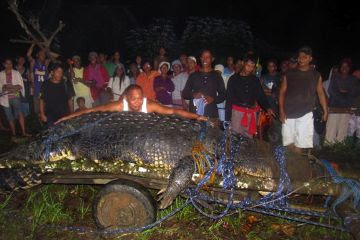 A needle that long could skewer this giant crocodile the long way...with 5 feet to spare! I still have a few full sharps containers myself. For whatever reason, it's hard to throw them away. Maybe a healthy reminder for me to be even that much more grateful for my little one. What can we say? Love hurts?!? Just have to say again...she's so beautiful! Girl...can't believe you have all those needles!!! I filled up 6 of the big sharps containers, but I never kept them (or counted them!) sort of wish I had now, just for fun. And the glowing tomato? AWESOME! I have so many sharps containers.. and still counting! I'm new to your blog but just wanted to say 'Hi'. wow, that's a lot of needles. those decorated eggs are so pretty. I've never counted ours, and I keep finding more sharps containers hidden on high shelves around our house. I really must get rid of them at some point! Hope things are going absolutely beautifully for you! Your pysanky are gorgeous. That is a lot of needles! Glad you were able to find some uses for the leftovers. You actually counted the syringes? haha, that is hilarious. love the eggs. is it wax decorations? I'm posting this anonymously because of the content. I took an unused needle loaded it with a laxative and punctured a frozen dinner with it. I took it to work to catch the person stealing my frozen dinners. Even wrote "Don't eat this" on it. I have a feeling they didn't steal ever again after eating my special frozen dinner.